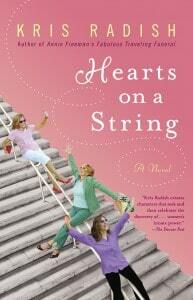 Hearts on a String delves deeply into the emotions of five very different women who are thrown together by chance-only to discover that they have more in common than they ever could have imagined. Holly Blandeen has always cherished the story her grandmother told her about the thread that connects all women, tying them forever in sisterhood. It’s a beautiful idea, but with all the curveballs life has thrown her way, Holly has often felt isolated, different from other women. That starts to change when she meets four strangers in an airport and they agree to share a luxury hotel suite because a powerful spring storm is barreling across the country, stranding travelers from California to Florida. What begins as a spur-of-the-moment decision becomes an unlikely, unexpected, and sometimes reluctant exercise in female bonding, as these five exceptional women-each at a crossroads-swap stories, share secrets, and seek answers to the questions they’ve been asking about life, love, and the path to true happiness. A storm may have grounded them for the moment, but after this wild adventure in which anything can and does happen, they’ll never have to fly solo again. In the prologue of the story, the Great-grandma tells a child a story about a string that all women can see from this story on, I was hooked. This is a book you will pass on to all of your close friends for them to read. I love books that not only have a storyline, but you can understand and sympathize with the characters or you can see a bit of yourself in one or two of them. Or maybe you read and can learn something about yourself in what you learn from reading the book. As the books starts out, the ladies meet by chance in a bathroom one of them drops her cell phone in the toilet and needs to get it out. From that point, the women are thrown together in a funny way! We’ve all done something on accident so this story makes you want to read more and more just to see what is coming up next! Each of the ladies has a separate story and is at a crossroad in their life. As they share each other’s stories, they begin to look at things in their own lives. It goes back to a saying I heard once, learn from other people’s mistakes, you can’t make them all on your own!!!! This was a great book to read, a wonderful summertime book to read and pass on to your closest friend or person you feel would benefit the most!Â Â Sometimes it is not the â€œstoryâ€ but the meaning behind the book in the first place.Â Â I loved this book, and this is my honest opinion. I follow Kris Radish on Twitter @RazzMyBerry.